Fine condition hardback book and dustjacket. Clean, bright, tight and unread. As new. 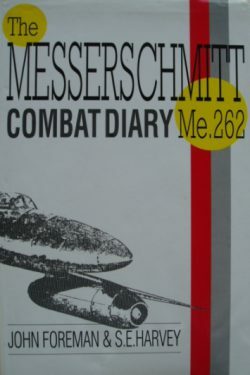 A very readable day by day account of the fabulous Me262 – the world’s first fully operational jet fighter – with an excellent Luftwaffe Ace signature. 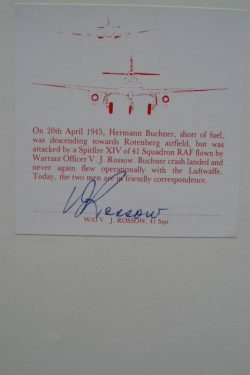 Hermann Buchner (1919 – 2005) was a German Luftwaffe fighter ace and recipient of the Knight’s Cross of the Iron Cross during World War II. The Knight’s Cross of the Iron Cross was awarded to recognise extreme battlefield bravery or successful military leadership. Buchner was credited with 46 tank victories and 58 aerial victories, including 12 while flying the Messerschmitt Me 262 jet fighter, accumulated in 631 combat missions. 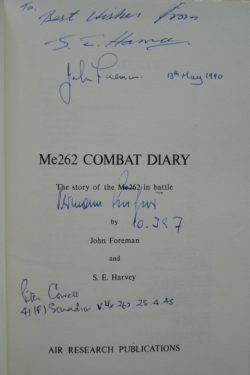 His autobiography ‘Stormbird’ was published in 2000 and is also available from Spitfire Books.